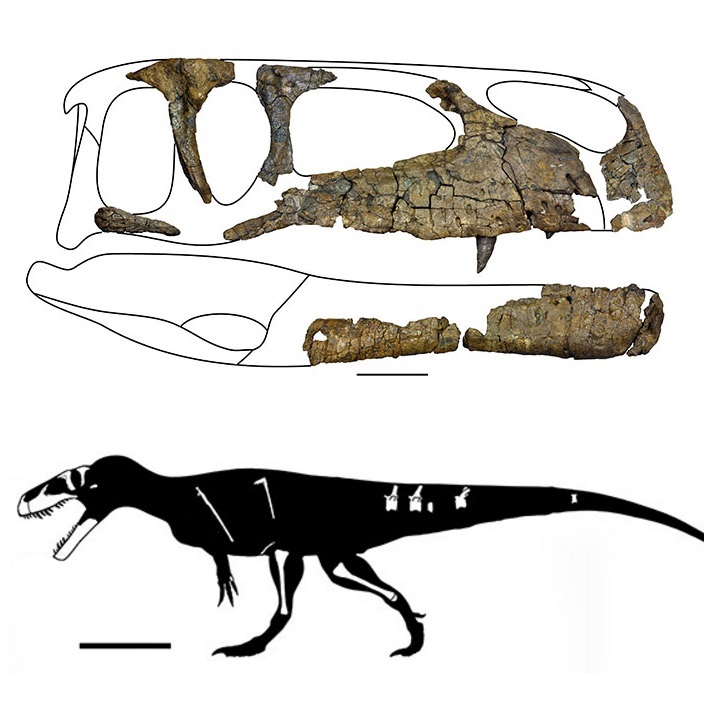 Fragmentary remains of a large, robustly built theropod dinosaur were recovered from the marine middle Callovian Ornatenton Formation of north-eastern Northrhine-Westphalia, Germany. The specimen includes a premaxilla, maxilla, lacrimal, postorbital, dentary, several caudal vertebrae, ribs, fibulae, astragalus, and partial calcaneum. 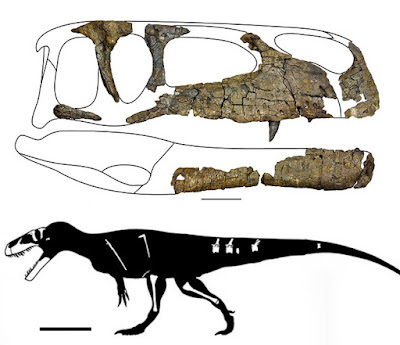 It is here described as a new species of megalosauroid, Wiehenvenator albati n. gen. n. sp., diagnosed by a strongly reduced maxillary antorbital fossa on the base of the ascending process of the maxilla, a very short anterior ramus of the lacrimal with an additional pneumatic depression anteroventral to the lacrimal fenestra, a transversely expanded orbital facet in the postorbital, and a laterally flexed proximal end of the ascending process of the astragalus. Phylogenetic analysis recovers Wiehenvenator as a megalosaurine megalosaurid, sister taxon to the Late Jurassic genus Torvosaurus. It thus adds to the considerable diversity of megalosauroids in the Middle Jurassic. A time-calibrated phylogeny of theropods indicates a rapid radiation of averostran theropods between the Toarcian and the Bathonian. 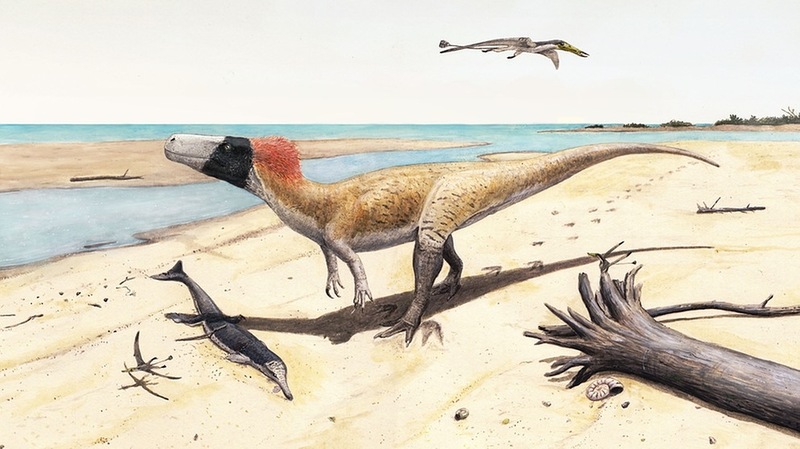 This radiation was probably triggered by the Pliensbachian-Toarcian extinction event, which might have been more important for theropod evolution than the Triassic-Jurassic extinction. 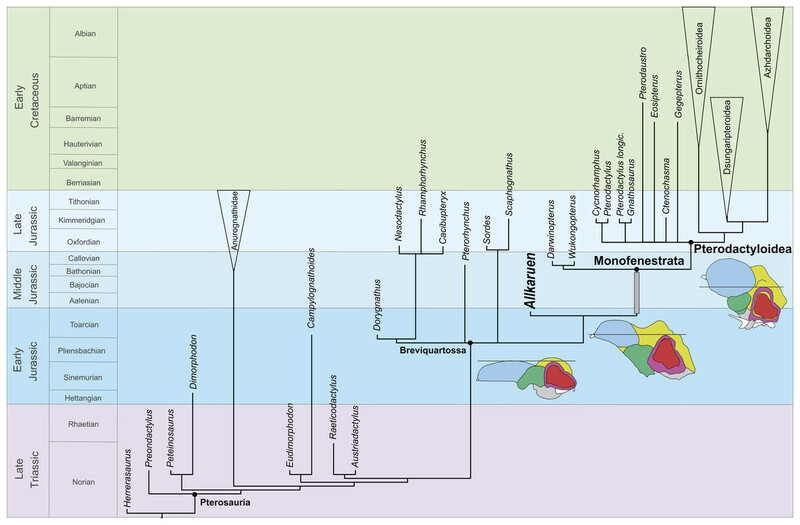 The fossil record indicates a faunal turnover from megalosauroid dominated Middle Jurassic to allosauroid / coelurosaur dominated Late Jurassic faunas. However, differences in the Middle and Late Jurassic theropod fossil records both in respect to geographic distribution of localities, as well as sampled environments make this inference problematic, at least in respect to allosauroids. 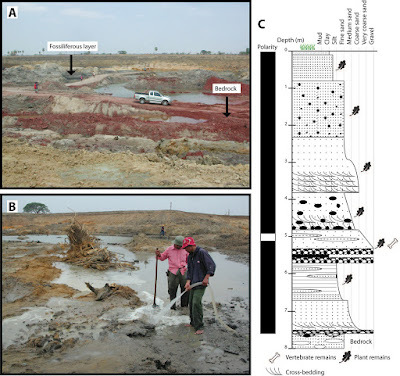 An analysis of environmental preferences of allosauroids and megalosauroids indicates that the former preferred inland environments, whereas the latter are more common in nearshore environments. Etymology. Wiehen, for the Wiehengebirge, a chain of hills south of Minden, where the holotype specimen was found and venator, Latin for hunter. The gender of the genus is masculine. 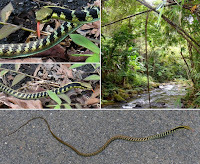 Type species. 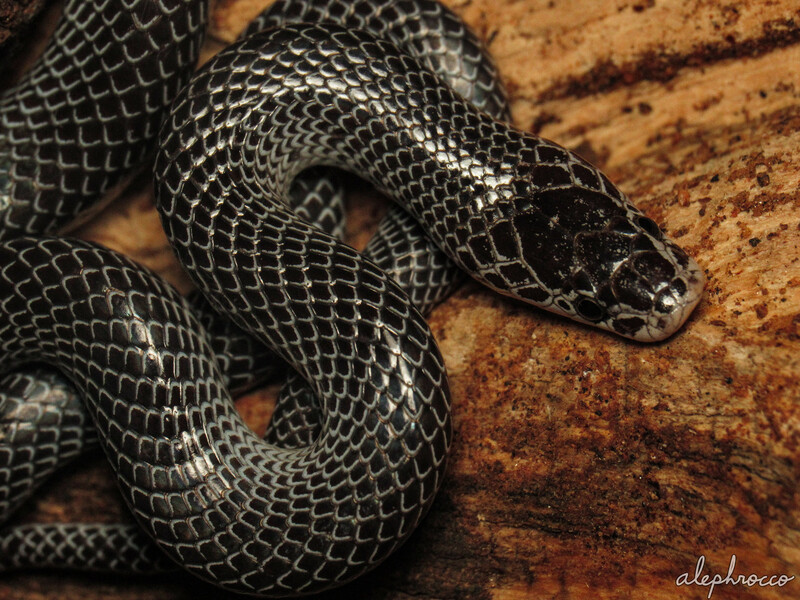 Wiehenvenator albati sp. nov.
Etymology. 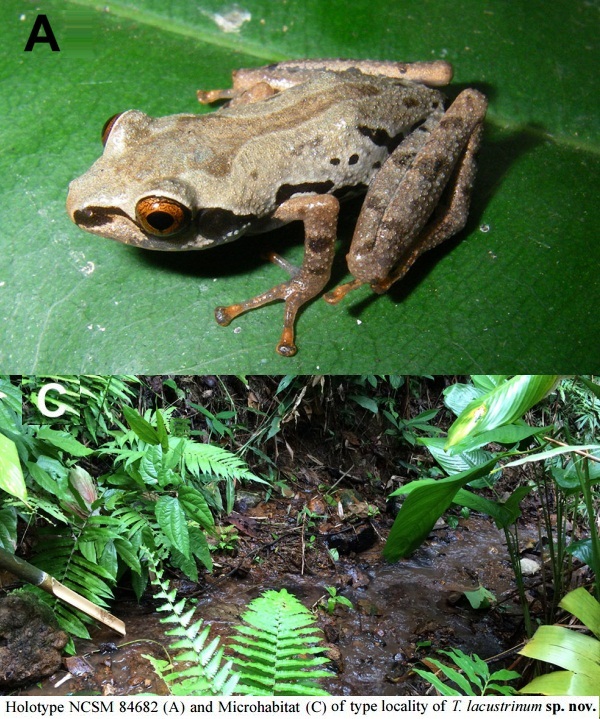 The species epithet honours Friedrich Albat, who found the holotype specimen. 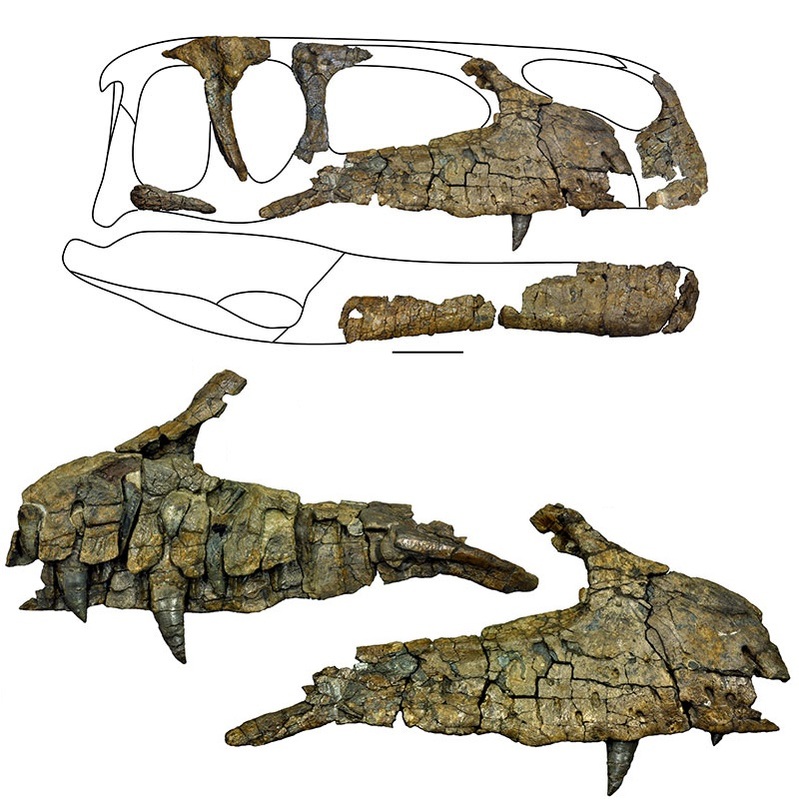 Holotype. Fragmentary skull and skeleton of a single individual; right premaxilla (WMN P27475), right maxilla (WMN P27504), right lacrimal (WMN P27457), right postorbital (WMN P27477), (? )anterior ramus of right quadratojugal (WMN P27470), partial right dentary (WMN P27461, 27462, 27466), six isolated teeth (WMN P27454, 27456, 27459, 27467, 27473, 27483), three caudal vertebrae (WMN P27499, 27500, 27501), five dorsal ribs and rib fragments (WMN P27464, 27465, 27476, 27480, 27503), a pair of fused posterior medial gastralia (WMN P27455), a manual phalanx (WMN P27482), both fibulae (WMN P27479, 27502), right astragalus (WMN P27458), and a partial right calcaneum (WMN P27484). Two further partial caudal vertebrae (WMN P29131, 47417) were found at different times in the float at the type locality and probably belong to the same individual. Type locality and horizon. Former Pott quarry, Lutternsche Egge, near Minden, north-eastern Northrhine-Westphalia, Germany. The bone-bearing layer is a condensation horizon with abundant bivalves of the species Gryphaea dilatata in the middle Ornatenton, Erymnoceras coronatum ammonite zone, middle Callovian (Riegraf, 1994). A partial skeleton of a new megalosaurid theropod, Wiehenvenator albati, from the Callovian marine Ornatenton of northern Germany adds to the diverse association of megalosaurid theropods from the Middle Jurassic of Europe. The new taxon is a derived megalosaurine megalosaurid closely related to Torvosaurus, which might be the only megalosaurid taxon to survive into the Late Jurassic. The available evidence supports a rapid radiation of averostran theropods within probably less than 15 Myr during the latest Early and early Middle Jurassic, during which at least nine important lineages were established: Ceratosauridae, Noasauridae, Abelisauridae, Piatnitzkysauridae, Megalosauridae, Spinosauridae, Metriacanthosauridae, Allosauria, and Coelurosauria. Theropod faunal composition seems to show marked changes during the Jurassic with mainly megalosauroid taxa being reported from the Middle Jurassic, whereas allosauroids and, especially, coelurosaurs gained increasing importance in the Late Jurassic. Ceratosaurs seem to have been rare components of both Middle and Late Jurassic theropod faunas, although this might partially reflect geographic patterns, as some clades might have radiated first in southern Gondwana, a region that is poorly represented in the fossil record in post-Bajocian localities. Both geographical distribution and environments sampled during different times of the Jurassic might have an important impact on our views of theropod faunal composition at different times. Pterosaurs are an extinct group of highly modified flying reptiles that thrived during the Mesozoic. 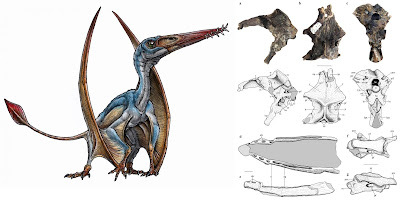 This group has unique and remarkable skeletal adaptations to powered flight, including pneumatic bones and an elongate digit IV supporting a wing-membrane. 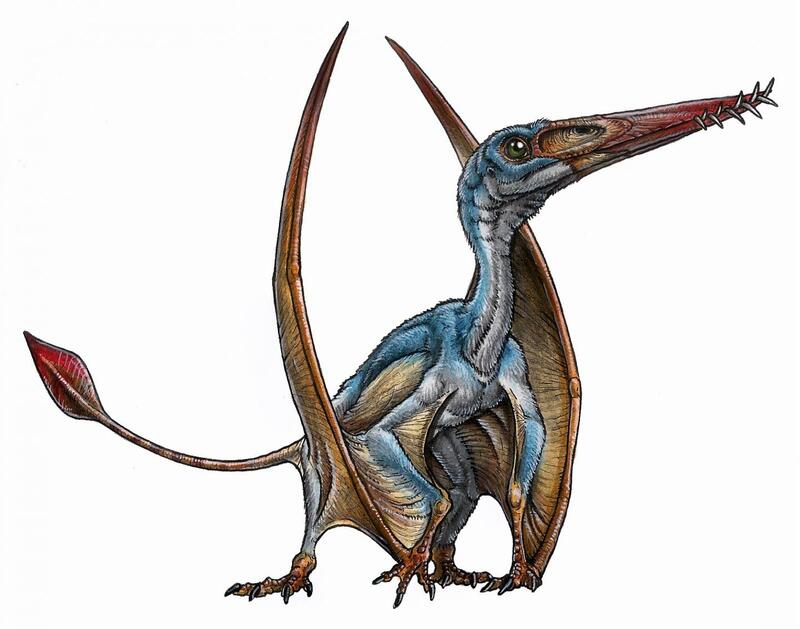 Two major body plans have traditionally been recognized: the primitive, primarily long-tailed paraphyletic “rhamphorhynchoids” (preferably currently recognized as non-pterodactyloids) and the derived short-tailed pterodactyloids. These two groups differ considerably in their general anatomy and also exhibit a remarkably different neuroanatomy and inferred head posture, which has been linked to different lifestyles and behaviours and improved flying capabilities in these reptiles. 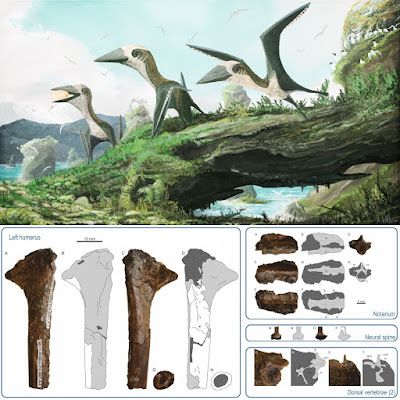 Pterosaur neuroanatomy, is known from just a few three-dimensionally preserved braincases of non-pterodactyloids (as Rhamphorhynchidae) and pterodactyloids, between which there is a large morphological gap. 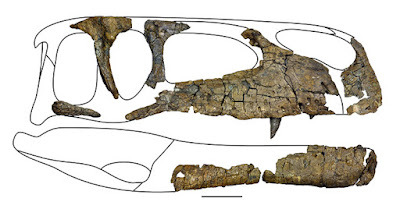 Here we report on a new Jurassic pterosaur from Argentina, Allkaruen koi gen. et sp. nov., remains of which include a superbly preserved, uncrushed braincase that sheds light on the origins of the highly derived neuroanatomy of pterodactyloids and their close relatives. 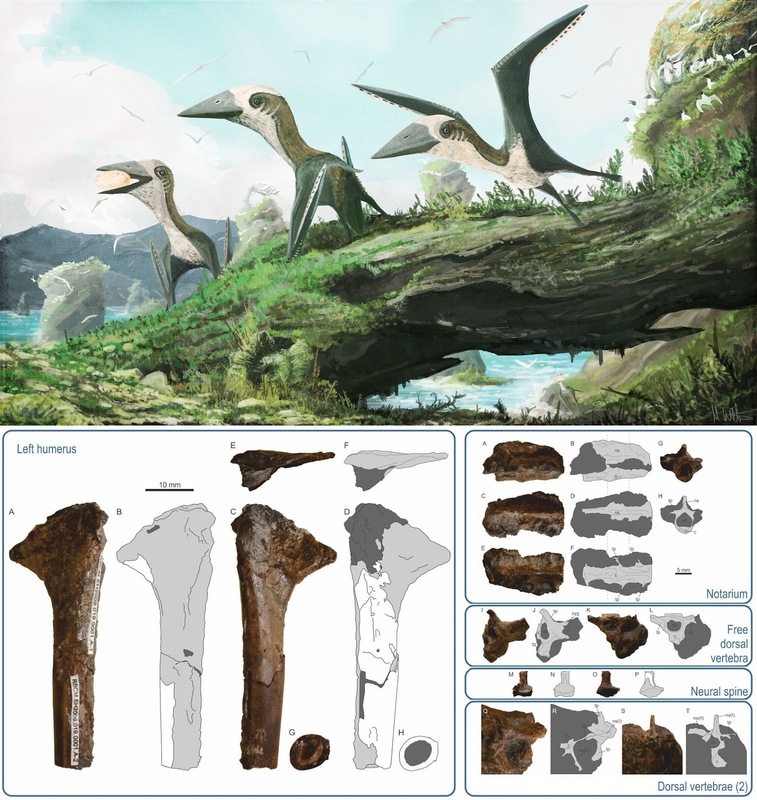 A µCT ray-generated virtual endocast shows that the new pterosaur exhibits a mosaic of plesiomorphic and derived traits of the inner ear and neuroanatomy that fills an important gap between those of non-monofenestratan breviquartossans (Rhamphorhynchidae) and derived pterodactyloids. These results suggest that, while modularity may play an important role at one anatomical level, at a finer level the evolution of structures within a module may follow a mosaic pattern. Figure 1: Selected skeletal elements of Allkaruen koi. 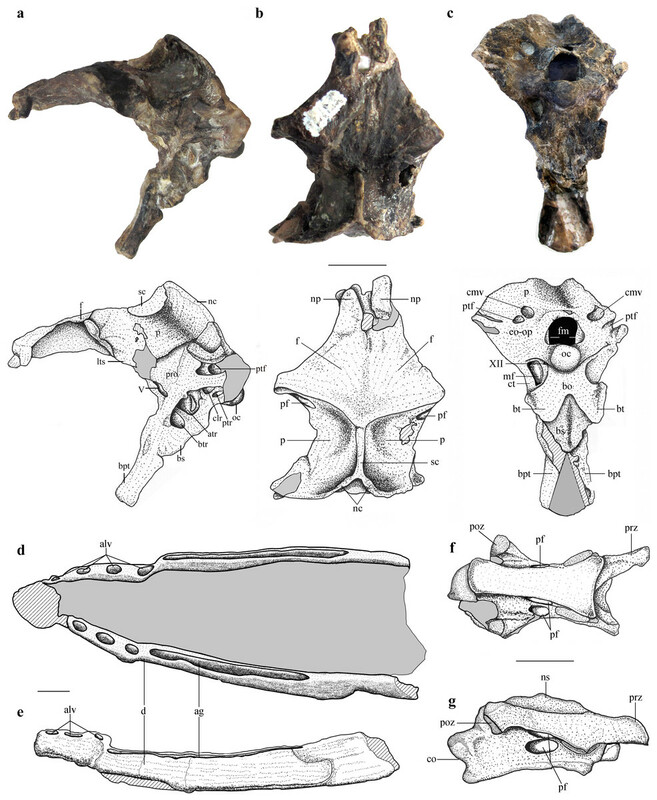 (A–C), Holotype braincase (MPEF-PV 3613) in left lateral (A), dorsal (B) and posteroventral (C) views. (D, E), Mandible (MPEF-PV 3609) in dorsal (D) and right lateral (E) view. (F, G), Cervical vertebra (MPEF-PV 3615) in ventral (F) and right lateral (G) view. Allkaruen koi gen. et sp. nov.
Etymology. Genus name from the native Tehuelche word ‘all’ meaning brain, and ‘karuen,’ meaning ancient. Species name from Tehuelche ‘koi’ meaning lake, referring to the lacustrine setting of the type locality. Holotype. MPEF-PV (Museo Paleontológico Egidio Feruglio) 3613, braincase, a mandible (MPEF-PV 3609) and a cervical vertebrae (MPEF-PV 3615) (Figs. 1–7; Figs. S1–S3). Referred material. Referred material includes a mid cervical vertebrae (MPEF-PV -3616. Type locality and horizon. Locality La Lluvia, Cañadón Carrizal, Cerro Cóndor, Chubut, Argentina. Cañadón Asfalto Formation, latest Early-early Middle Jurassic (Cúneo et al., 2013). The discovery of strongly correlated character state distributions in Darwinopterus led Lü et al. (2010) to suggest that major anatomical regions might have behaved as integrated modules that changed at different times and rates during pterosaur evolution. However, Allkaruen demonstrates that, whereas modular evolution might have operated at an inclusive morphological level (e.g., skull + neck versus the remainder of the postcranium), evolution within at least one of these modules (the neurocranium and braincase) seems to have followed a mosaic pattern. The late Early-early Middle Jurassic age of Allkaruen (Cúneo et al., 2013) also provides new information on the timing of transformations during the evolution of the derived pterodactyloid skull from that of basal pterosaurs. 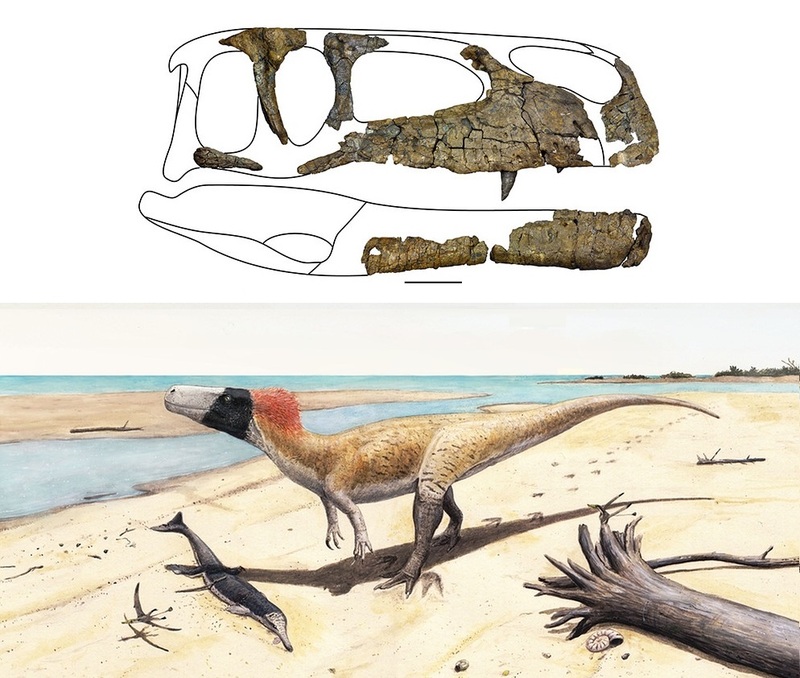 The derived features of the cranium of Allkaruen indicate that some typical “pterodactyloid” skull features had already evolved by the time of the Early/Middle Jurassic boundary (Fig. 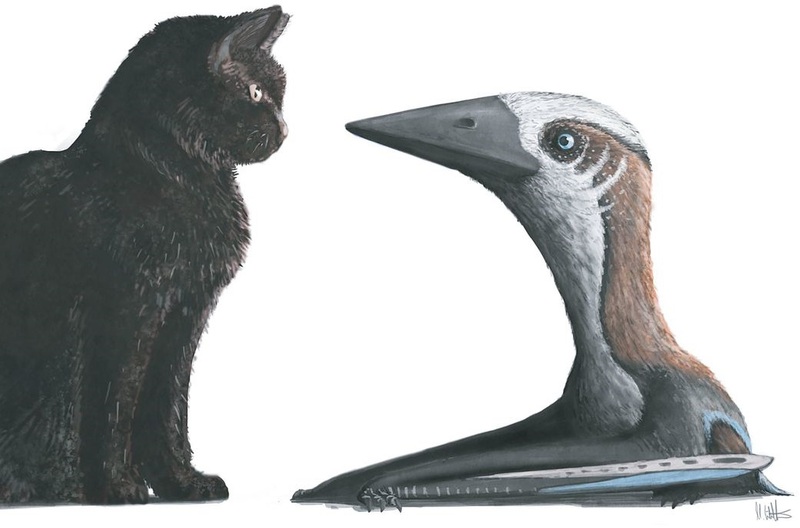 7), before the origin of pterodactyloids and the appearance of their modified postcranial skeleton. Prior to this discovery, a large suite of cranial features was presumed to have appeared somewhat later, during the late Middle to Late Jurassic, the age of the basal monofenestratans, Darwinopterus (Lü et al., 2010) and Wukongopterus (Wang et al., 2009) and the oldest pterodactyloids (Andres, Clark & Xu, 2014). 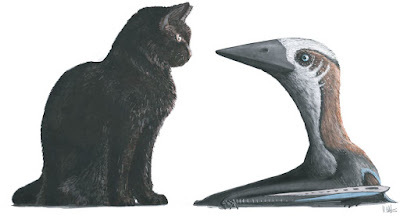 Unfortunately, the Early-Middle Jurassic is a period with a very poor pterosaur fossil record, in contrast to the relatively diverse assemblage of pterosaurs known from both the Late Triassic and the Late Jurassic–Cretaceous (Barrett et al., 2008; Butler, Benson & Barrett, 2013; Benson et al., 2014). 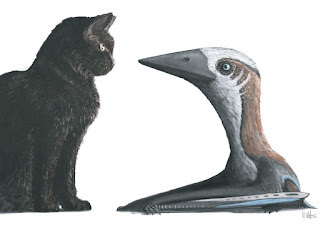 The early evolutionary origin and diversification inferred for derived pterosaurs (Fig. 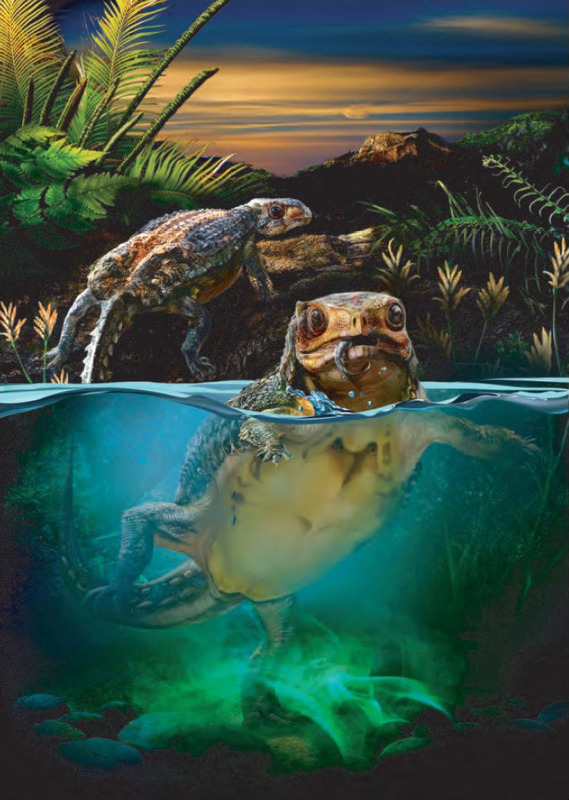 4), adds further evidence in support of the hypothesis that the origin and diversification of major vertebrate lineages (e.g., dinosaurs (Allain & Läng, 2009; Pol & Rauhut, 2012), crocodyliforms (Pol & Gasparini, 2009), turtles (Sterli, Pol & Laurin, 2013), mammals (Luo et al., 2011)) occurred prior to the Early/Middle Jurassic boundary (Allain & Läng, 2009; Cúneo et al., 2013). This pattern was previously obscured by the worldwide poor fossil record of terrestrial vertebrates during this evolutionarily critical period of time. D. striatus (Cohn, 1906) from which it is distinguished by several aspects of its morphology. 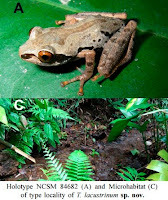 The discovery of D. nigroserratus sp. nov. underscores the notion that the hilly western parts of Thailand are in need of further exploration. G. Vogel, J.V. Rooijen and S. Hauser. 2012. A New Species of Dendrelaphis Boulenger, 1890 (Squamata: Colubridae) from Thailand and Myanmar. Zootaxa. 3392; 35-46. 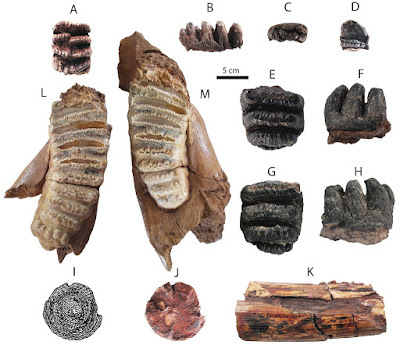 The fluviatile terrace deposits of Khok Sung, Nakhon Ratchasima province, have yielded more than one thousand fossils, making this the richest Pleistocene vertebrate fauna of Thailand. The excellent preservation of the specimens allows precise characterization of the faunal composition. The mammalian fauna consists of fifteen species in thirteen genera, including a primate, a canid, a hyaenid, proboscideans, rhinoceroses, a suid, cervids, and bovids. Most species correspond to living taxa but globally (Stegodon cf. 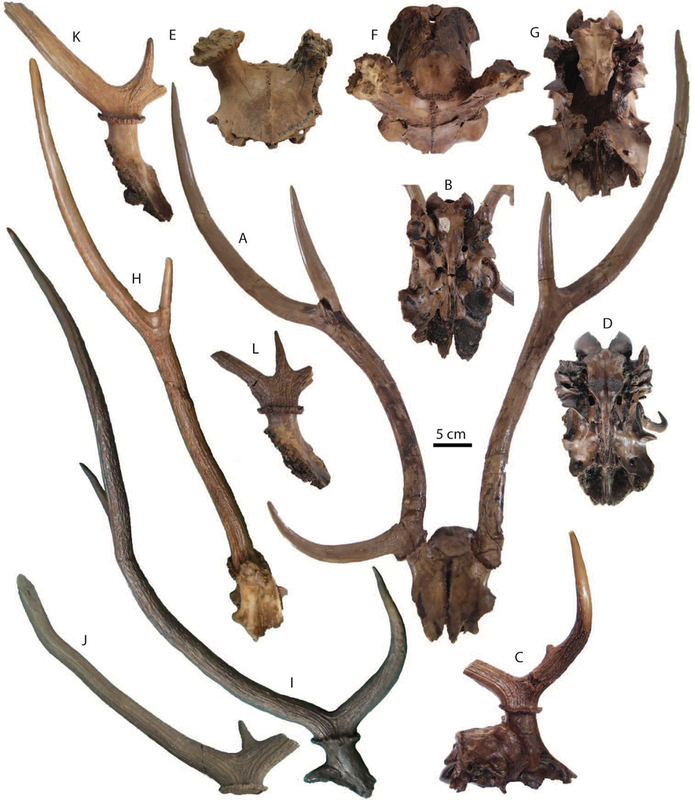 orientalis) and locally (Crocuta crocuta ultima, Rhinoceros unicornis, Sus barbatus, and Axis axis) extinct taxa were also present. The identification of Axis axis in Khok Sung, a chital currently restricted to the Indian Subcontinent, represents the first record of the species in Southeast Asia. Three reptilian taxa: Crocodylus cf. 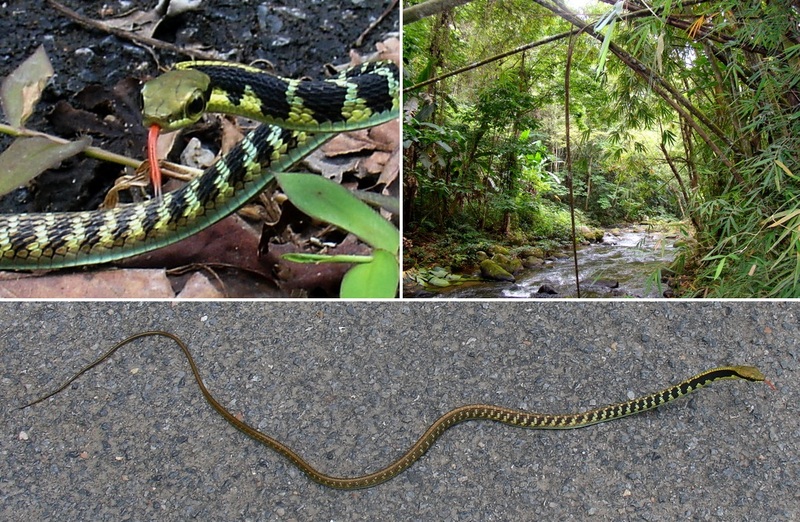 siamensis, Python sp., and Varanus sp., are also identified. Faunal correlations with other Southeast Asian sites suggest a late Middle to early Late Pleistocene age for the Khok Sung assemblage. 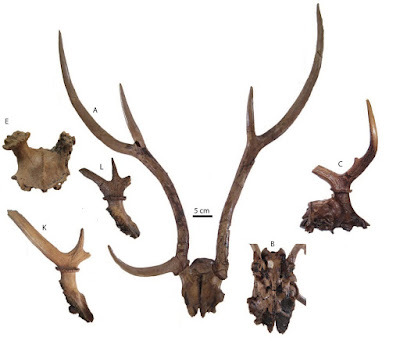 However, the Khok Sung mammalian fauna is most similar to that of Thum Wiman Nakin, dated to older than 169 ka. 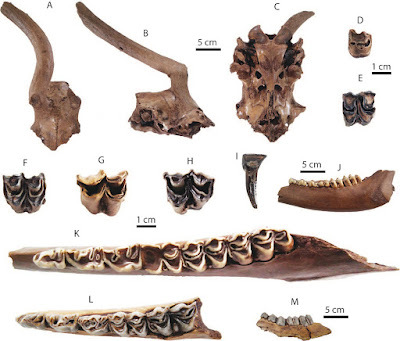 The Khok Sung large mammal assemblage mostly comprises mainland Southeast Asian taxa that migrated to Java during the latest Middle Pleistocene, supporting the hypothesis that Thailand was a biogeographic pathway for the Sino-Malayan migration event from South China to Java. Figure 1. 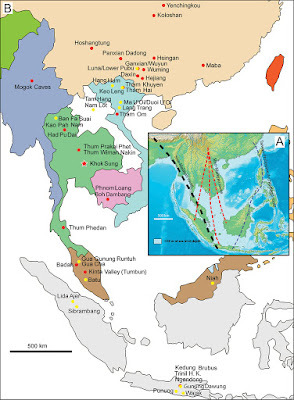 Map of Southeast Asia showing A the Sundaland boundaries and the migration route hypothesis: Siva-Malayan route (black), Sino-Malayan route (red), and Taiwan-Philippine Archipelago route (blue) and B the location of the Khok Sung sand pit (star) and other Middle (red circle) and Late (yellow circle) Pleistocene sites. The Sunda shelf boundaries at the sea level about 120 m lower than the present day are compiled from Voris (2000). Some Middle Pleistocene sites in South China and central Eastern China are shown in the map. Only Gua Cha (Peninsular Malaysia) is Holocene in age (Groves 1985, Bulbeck 2003). 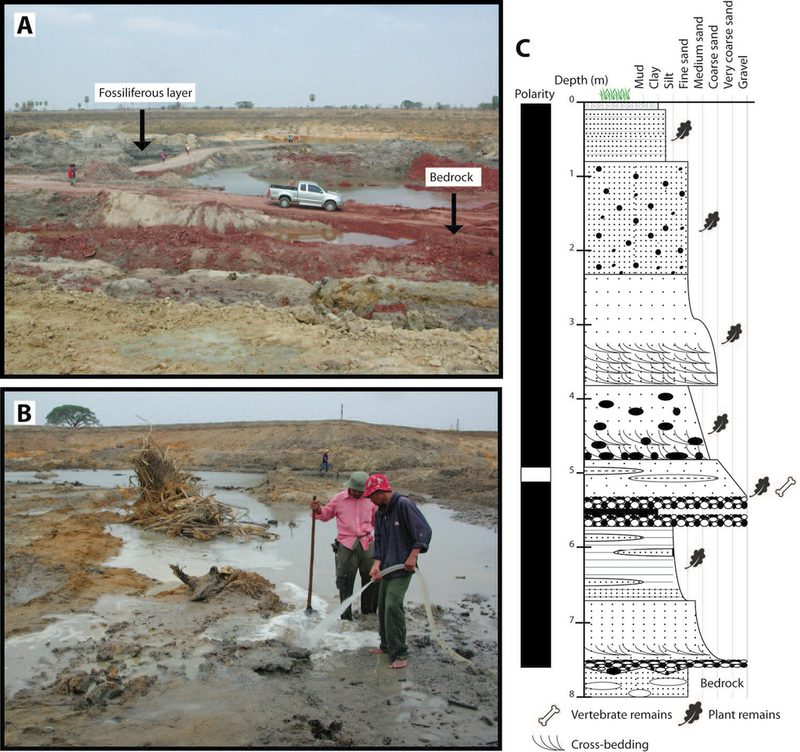 A the sand pit during the paleontological excavation B the location of vertebrate fossils C the lithostratigraphic and paleomagnetic sections (modified from Suraprasit et al. 2015). A–B DMR-KS-05-03-28-14, a right DP4 in occlusal (A) and buccal (B) views C DMR-KS-05-03-19-7, an anterior lobe of DP4 in occlusal view D DMR-KS-05-04-01-8, a left dp3 in occlusal view E–F DMR-KS-05-03-29-1, a left posterior fragment of M2 in occlusal (E) and buccal (F) views G–H DMR-KS-05-03-22-19, a right posterior fragment of M3 in occlusal (G) and buccal (H) views I–K DMR-KS-05-03-15-2, a fragmentary upper tusk in proximal (I–J) and dorsal (K) views L DMR-KS-05-03-08-1, a left mandible with m3 in occlusal view M DMR-KS-05-03-08-2, a right mandible with m3 in occlusal view. 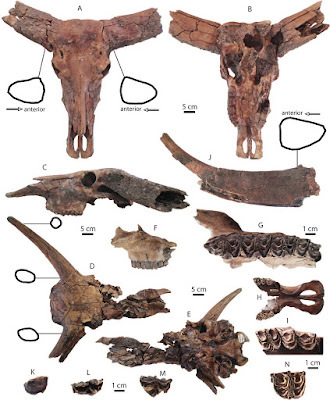 A–B DMR-KS-05-04-18-50, a cranium with nearly complete antlers in dorsal (A) and ventral (B) views C–D DMR-KS-05-03-00-30, a cranium in lateral (C) amd ventral (D) views E DMR-KS-05-03-18-X9, a cranium in anterior view F–G DMR-KS-05-03-27-1 a cranium in dorsal (F) and ventral (G) views H DMR-KS-05-03-31-30, a right antler in anterior view; (I) DMR-KS-05-03-22-4, a right antler in lateral view J DMR-KS-05-03-18-21, a left antler fragment in lateral view K DMR-05-03-22-2, a left antler fragment in lateral view L DMR-KS-05-03-19-81, a left antler fragment in medial view. A–C DMR-KS-05-04-20-4, a cranium in dorsal (A), lateral (B), and ventral (C) views D DMR-KS-05-03-15-11, a right P2 E DMR-KS-05-03-00-24, a left M1 F DMR-KS-05-03-00-23, a right M2 G DMR-KS-05-03-27-6, a left M3 H DMR-KS-05-04-9-2, a left M3 I DMR-KS-05-03-29-2, a right i1 in lingual view J–K DMR-KS-05-03-27-2, a left mandible in lateral (J) and occlusal (K) views L–M DMR-KS-05-04-9-5, a left mandible in occlusal (L) and lateral (M) views. All teeth are shown in occlusal view. A–C DMR-KS-05-03-20-1, a cranium in dorsal (A), ventral (B), and lateral (C) views and D–E DMR-KS-05-03-21-1, a cranium in dorsal (D) and ventral (E) views F–G DMR-KS-05-03-11-1, a right upper jaw in lateral (F) and occlusal (G) views H–I DMR-KS-05-03-16-3, a partial cranium in ventral view (H) with a right tooth row (I) J DMR-KS-05-03-16-2, a right horn core in dorsal view K DMR-KS-05-03-18-14, a left P2 L DMR-KS-05-03-00-103, a left DP3 M DMR-KS-05-04-29-8, a right DP4 N DMR-KS-05-03-00-7, a right M3. Cross-sections of basal horn cores are given. All isolated teeth are shown in occlusal view. a group of Hornby azhdarchoids on shore-living Campanian bird nests. Pterosaur fossils from the Campanian–Maastrichtian of North America have been reported from the continental interior, but few have been described from the west coast. The first pterosaur from the Campanian Northumberland Formation (Nanaimo Group) of Hornby Island, British Columbia, is represented here by a humerus, dorsal vertebrae (including three fused notarial vertebrae), and other fragments. 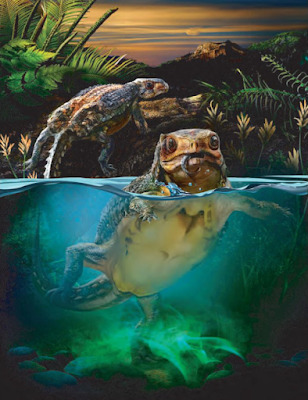 The elements have features typical of Azhdarchoidea, an identification consistent with dominance of this group in the latest Cretaceous. 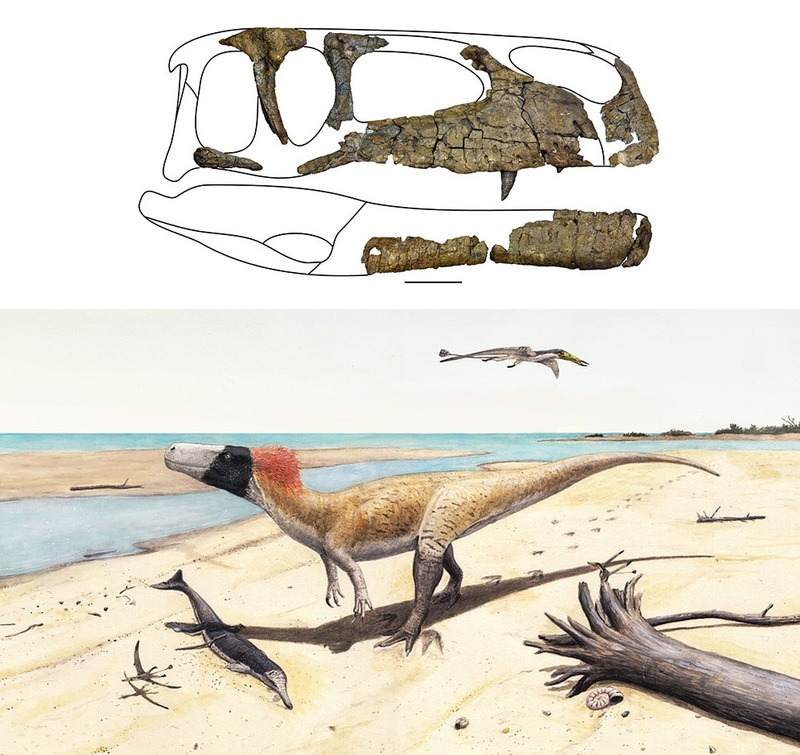 The new material is significant for its size and ontogenetic stage: the humerus and vertebrae indicate a wingspan of ca 1.5 m, but histological sections and bone fusions indicate the individual was approaching maturity at time of death. 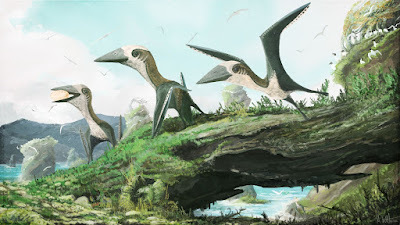 Pterosaurs of this size are exceedingly rare in Upper Cretaceous strata, a phenomenon commonly attributed to smaller pterosaurs becoming extinct in the Late Cretaceous as part of a reduction in pterosaur diversity and disparity. The absence of small juveniles of large species—which must have existed—in the fossil record is evidence of a preservational bias against small pterosaurs in the Late Cretaceous, and caution should be applied to any interpretation of latest Cretaceous pterosaur diversity and success. Figure 6. Speculative restoration of a 1.4 m wingspan azhdarchid, representing the atypically diminutive Late Cretaceous azhdarchoid specimen RBCM.EH.2009.019.0001, against a modern housecat (ca 300 mm tall at shoulder). A, a left humerus, in (a,b) dorsal, (c,d) ventral, (e,f) proximal and (g,h) distal aspect. Shading denotes preserved bone cortex (white); weathered bone (light grey) and matrix (dark grey). Figure 3. Photographs and interpretative drawings of RBCM.EH.2009.019.0001 vertebral material. (a–h) Element C, fragment of notarium in (a,b), lateral; (c,d), dorsal; (e,f), ventral and (g,h), anterior aspect; (i–l) element D, partial dorsal vertebra in (i,j), dorsal and (k,l) posterior aspect; (m–p), element G, probable vertebral process, posterior(?) and (o,p), anterior(?) aspect; and (q–t) element E, two associated dorsal vertebrae in (q,r), dorsal and (s,t), anterior aspect (c, centrum; nc, neural canal; ns, neural spine; tp, transverse process). Approximate junctions between vertebrae of element C are indicated by dotted lines. 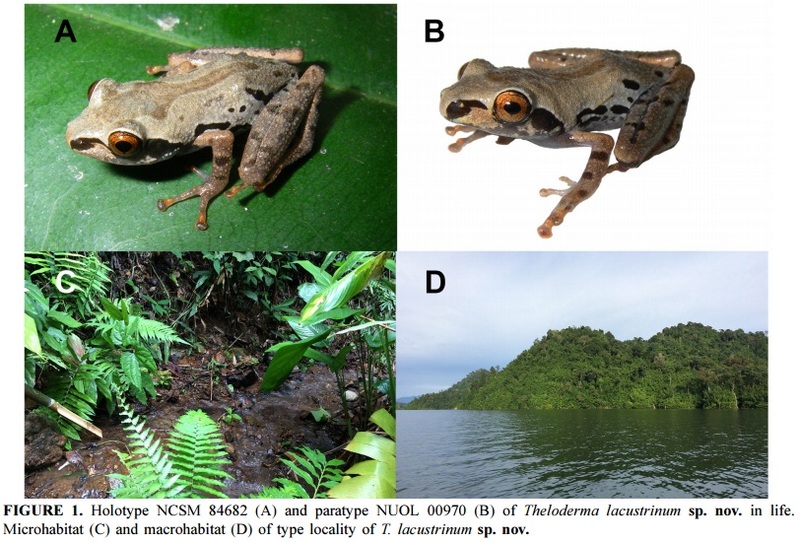 A new species of the rhacophorid frog genus Theloderma is described from the forested shoreline of the Nam Lik Reservoir, Vientiane Province, Laos. 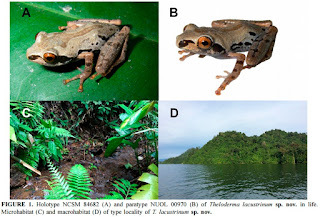 The new species differs from its congeners by having the combination of males with SVL 17.0–20.6; pearly asperities on dorsum; no vomerine teeth; disc diameter of finger III ca. 40% of tympanum diameter; uniformly gray venter; light brown dorsum with darker brown and black markings; and a uniformly bronze iris with small black reticulations. 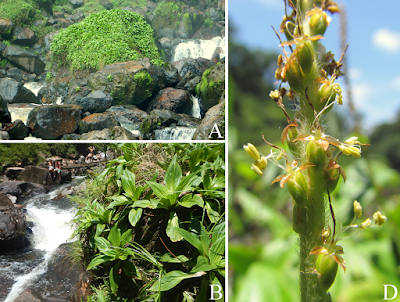 Molecular phylogenetic analysis of mitochondrial DNA sequence data infers that the new species is most closely related to T. lateriticum from northern Vietnam. 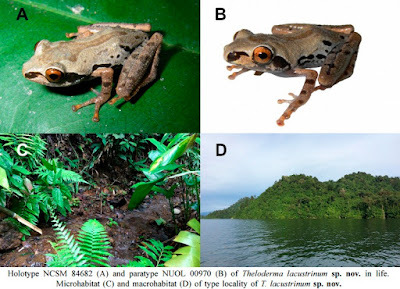 Evidence for the monophyly of Theloderma is reviewed. Etymology. 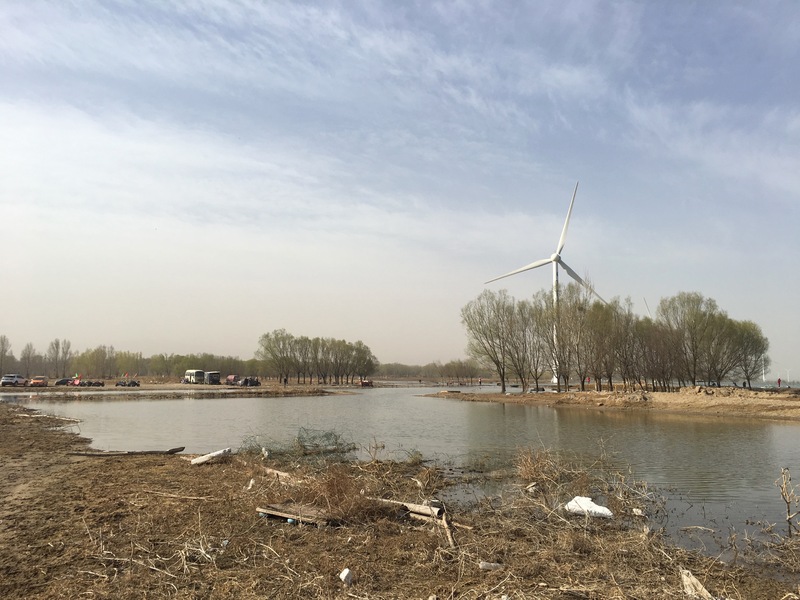 The specific epithet taken from lacustrinus L., of lakes, in reference to Nam Lik Reservoir, a large, man-made reservoir formed by a hydropower dam that has inundated the vicinity of the type locality. Diagnosis. Assigned to the genus Theloderma on the basis of molecular data (Fig. 2). A very small-sized (second smallest known) species of Theloderma having the combination of males with SVL 17.0–20.6; pearly asperities on dorsum; no vomerine teeth; disc diameter of finger III ca. 40% of tympanum diameter; uniformly gray venter; light brown dorsum with darker brown and black markings; and a uniformly bronze iris with small black reticulations. 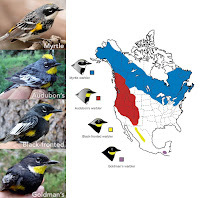 Distribution, natural history, and conservation. Theloderma lacustrinum sp. nov. is currently known only from the type and paratype localities (Fig. 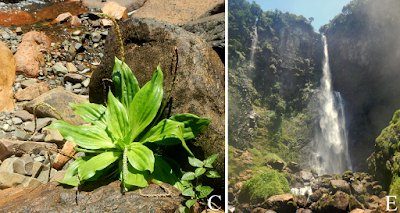 3), where it was collected at night (1820–2215 h) on leaves 30–80 cm above the ground near two rocky streams (292–361 m elev.) 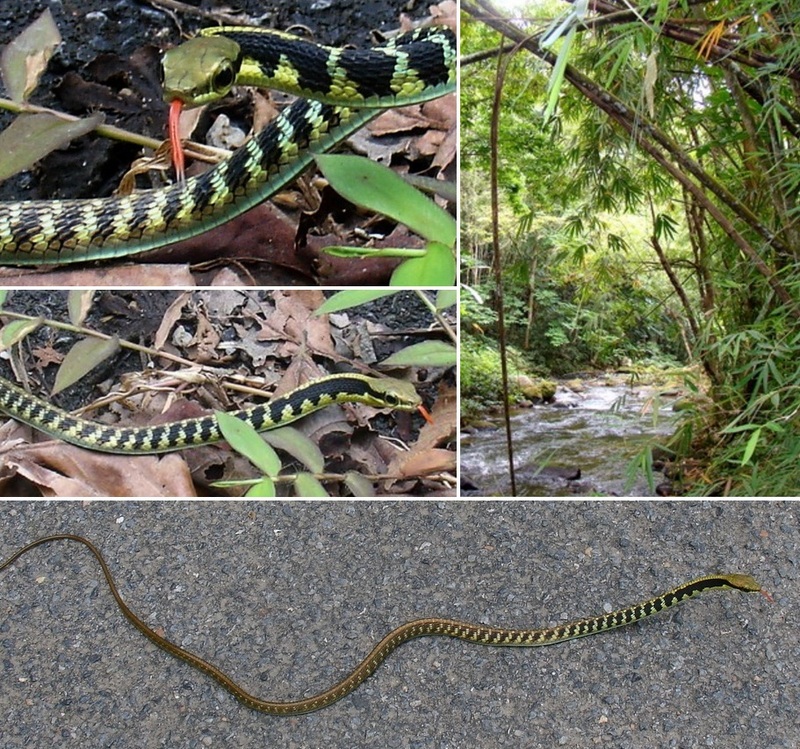 in semi-evergreen forest that flow into the Nam Lik Reservoir (Fig. 1). The two known localities are approximately 5.7 air-km apart. We did not observe the new species at these localities during visits in April, July, and September 2015, suggesting that it may be seasonally active or most detectable during cooler, drier months (e.g., at lower heights in the forest canopy). The vicinity of the two known localities had not been surveyed for amphibians prior to construction of the hydroelectric dam, and thus it is not known how inundation from the reservoir may have impacted the range of the species. The four forms of Yellow-rumped Warbler, Setophaga coronata, have distinct breeding ranges, with a narrow hybrid zone between Myrtle and Audubon's in western Canada. 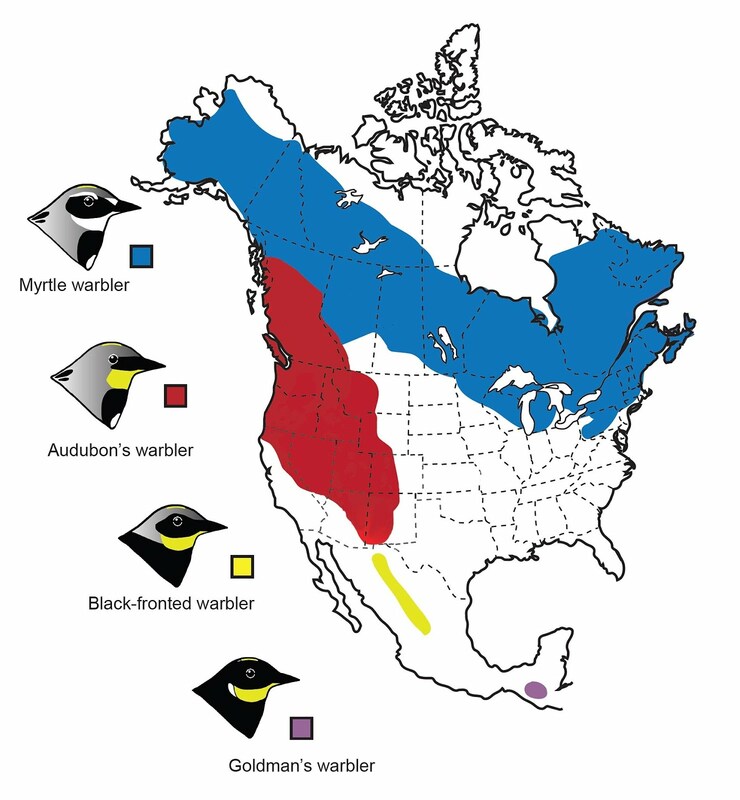 The researchers suggest that Myrtle, Audubon's and Goldman's are separate species. 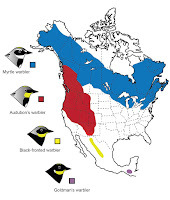 It's equivocal whether Black-fronted should be treated as a separate species or a subspecies of Audubon's. Populations that have experienced long periods of geographic isolation will diverge over time. 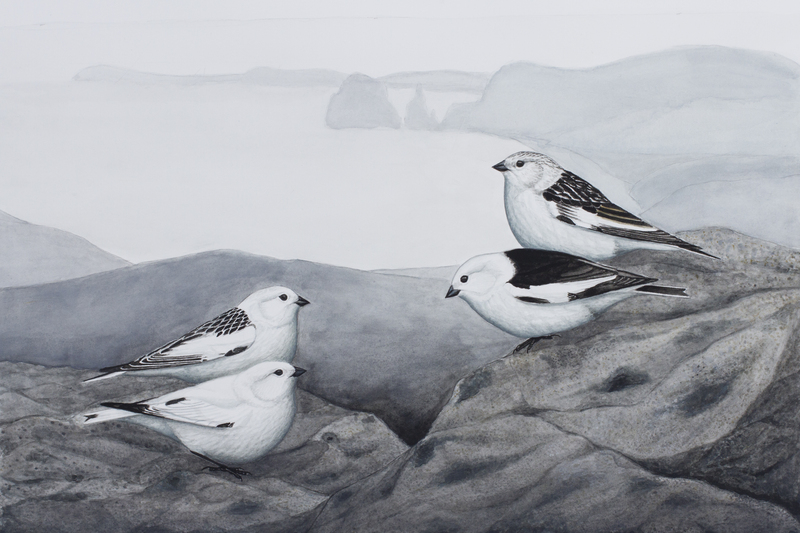 The application of high-throughput sequencing technologies to study the genomes of related taxa now allows us to quantify, at a fine scale, the consequences of this divergence across the genome. Throughout a number of studies, a notable pattern has emerged. In many cases, estimates of differentiation across the genome are strongly heterogeneous; however, the evolutionary processes driving this striking pattern are still unclear. 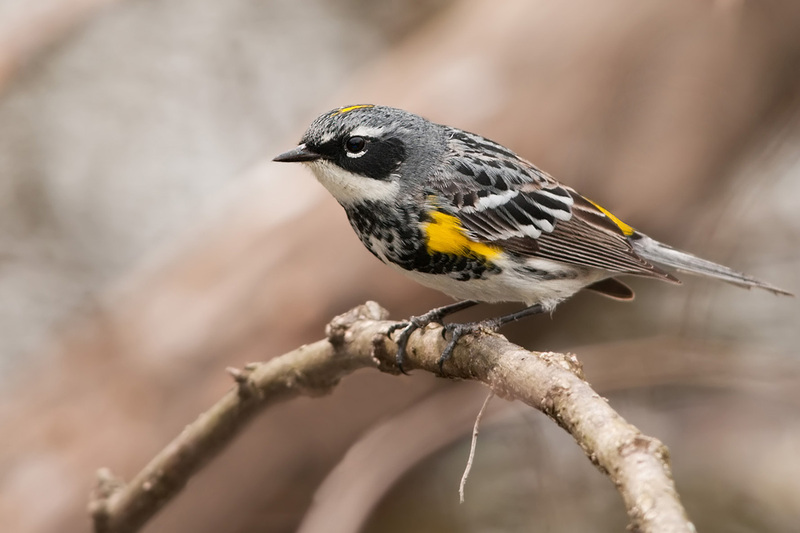 Here we quantified genomic variation across several groups within the Yellow-rumped Warbler species complex (Setophaga spp. ), a group of North and Central American wood warblers. We showed that genomic variation is highly heterogeneous between some taxa and that these regions of high differentiation are relatively small compared to those in other study systems. 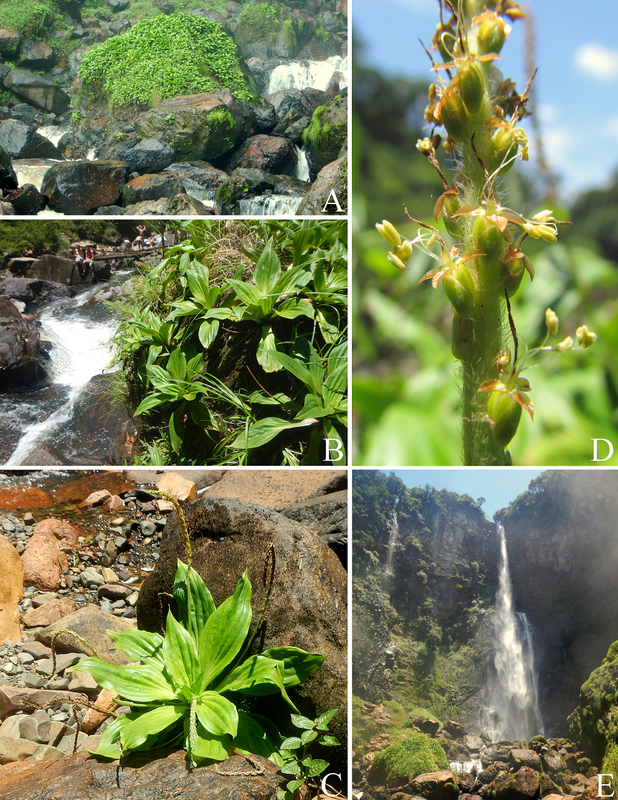 We found that the clusters of highly differentiated markers between taxa occur in gene-rich regions of the genome and exhibit low within-population diversity. 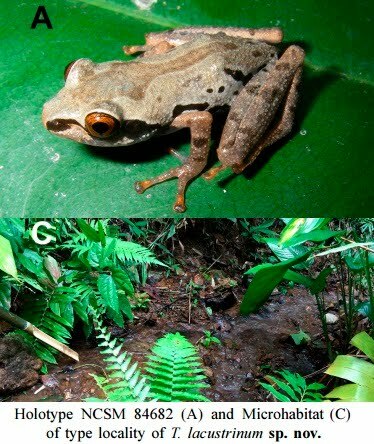 We suggest these patterns are consistent with selection, shaping genomic divergence in similar genomic regions across the different populations. 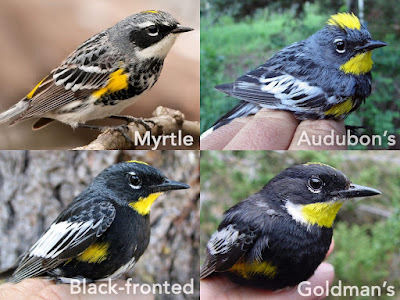 Our study also confirms previous results relying on fewer genetic markers that several of the phenotypically distinct groups in the system are also genomically highly differentiated, likely to the point of full species status. The Myrtle form breeds in eastern and northern North America. 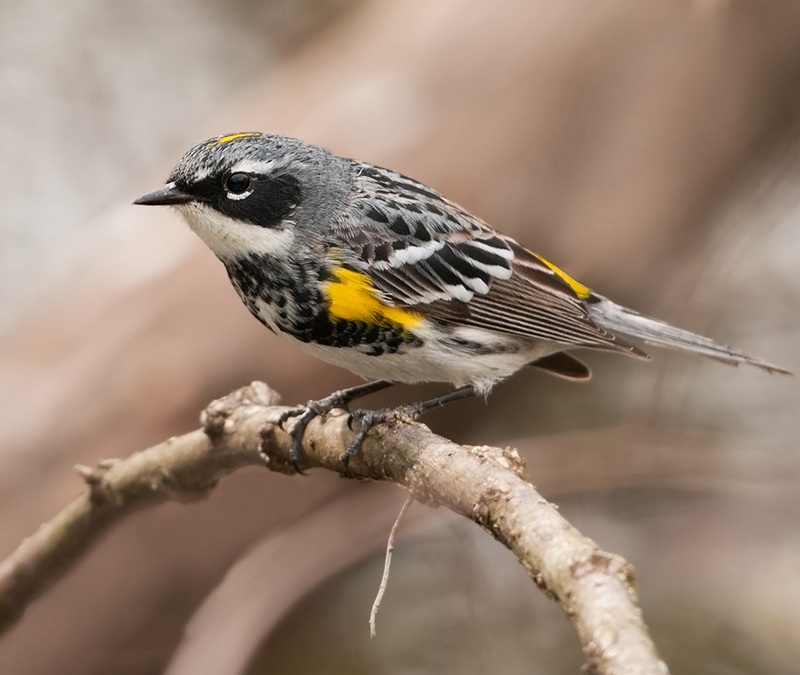 The male's white throat distinguishes it from the three other forms, along with other differences. 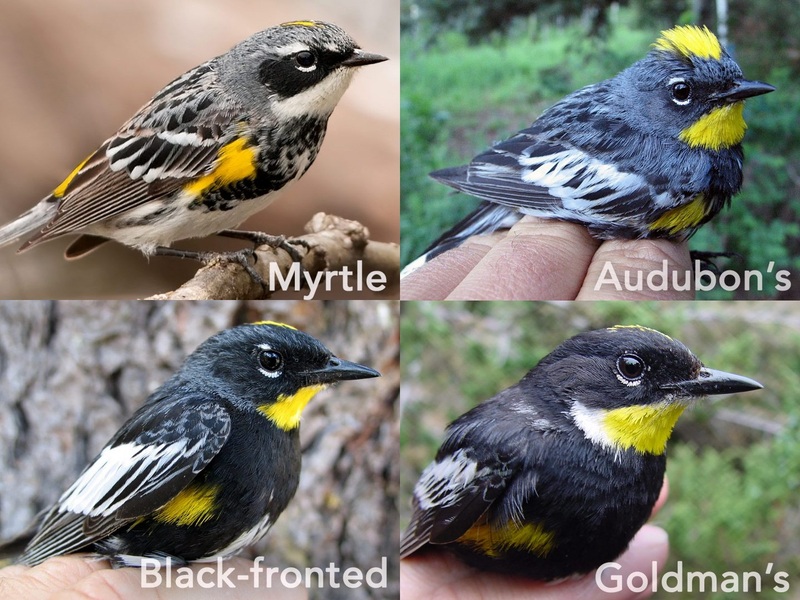 Goodbye, Yellow-Rump: Will We See A Return To Myrtle And Audubon’s Warblers? RESUMEN: Las poblaciones que han experimentado largos periodos de aislamiento geográfico se diferenciarán con el paso del tiempo. La aplicación de tecnologías de secuenciación de alto rendimiento para el estudio de los genomas de taxones relacionados ahora nos permite cuantificar a escala fina las consecuencias de esta divergencia s través del genoma. Luego de numerosos estudios emerge un patrón notable: en muchos casos los estimados de diferenciación a través del genoma son fuertemente heterogéneos. Sin embargo, los procesos evolutivos que gobiernan este patrón aún no son claros. 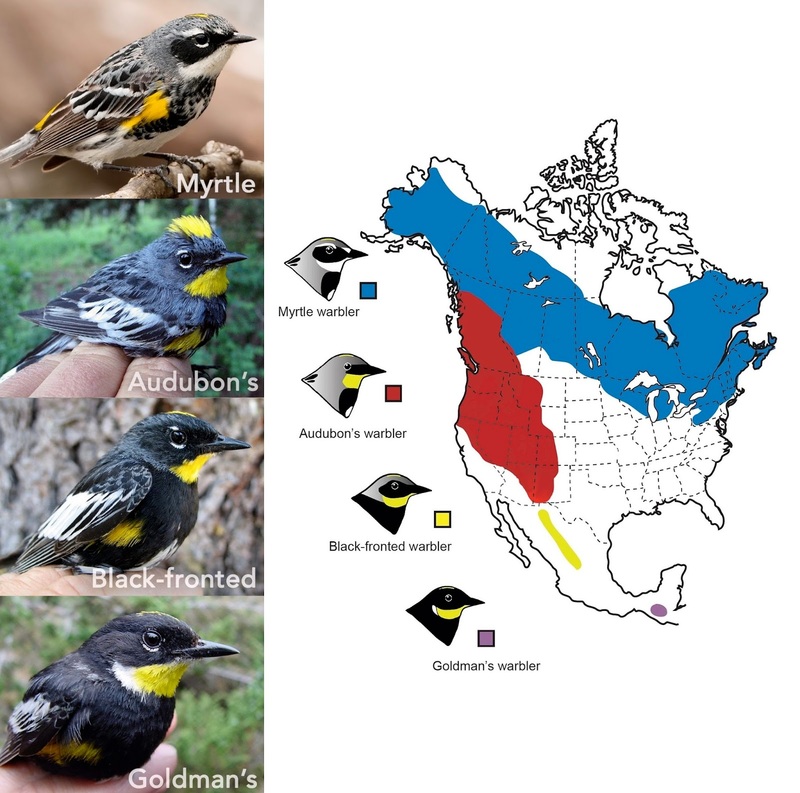 En este estudio cuantificamos la variación genómica a través de varios grupos dentro del complejo de especies de Setophaga coronata, un grupo de reinitas de Norte y Centroamérica. Mostramos que la variación genómica es altamente heterogénea entre algunos de los taxones y que las regiones de alta diferenciación son relativamente pequeñas en comparación con otros sistemas de estudio. Encontramos que las agrupaciones de marcadores áltamente diferenciados entre taxones se encuentran en regiones del genoma ricas en genes y también muestran baja diversidad intrapoblacional. 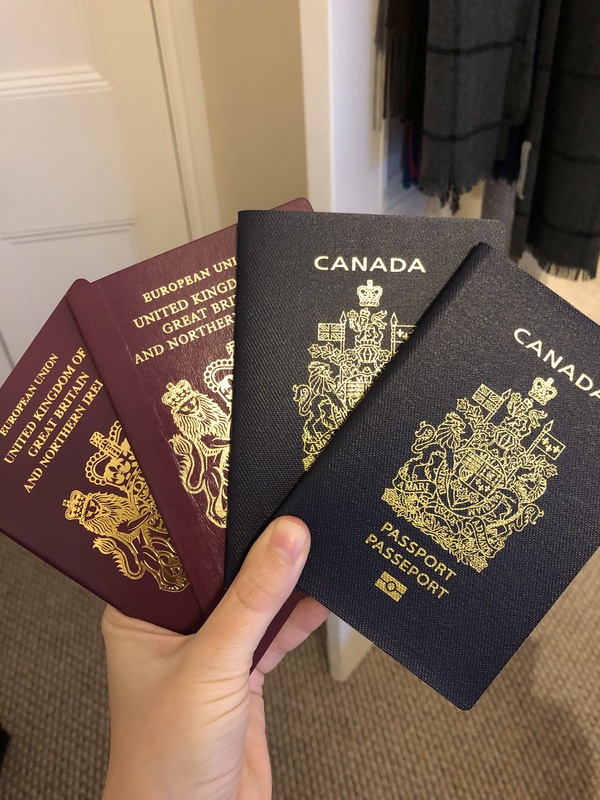 Sugerimos que estos patrones son consistentes con un efecto de procesos de selección natural sobre la divergencia genómica en regiones genómicas similares a través de las diferentes poblaciones. Nuestro estudio también confirma resultados previos basados en pocos marcadores genéticos en los que se determinó que muchos de los grupos fenotípicamente distintos en este sistema también están áltamente diferenciados en sus genomas, probablemente al punto en que pueden ser consideradas con el estatus de especie. The parrots (Psittacidae: Lophopsittacus, Psittacula, Necropsittacus, Mascarinus) of the Mascarenes (Mauritius, Réunion, Rodrigues) have been relatively poorly studied. Most analyses have been based on a few skins, insufficient fossil material, and unreliable contemporary accounts and illustrations, which have led to erroneous interpretations. 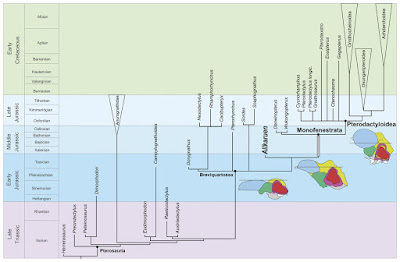 The discovery of new fossil remains of parrots and new interpretations of contemporary descriptions and illustrations has clarified many issues. One problematic species, Lophopsittacus bensoni is here removed to the genus Psittacula. A detailed comparative analysis of fossil skeletal elements indicates that the affinities of the Mascarene parrots lie within the Psittaculini, a wide ranging tribe of parrots that occurs mainly in Southeast Asia and Australasia. 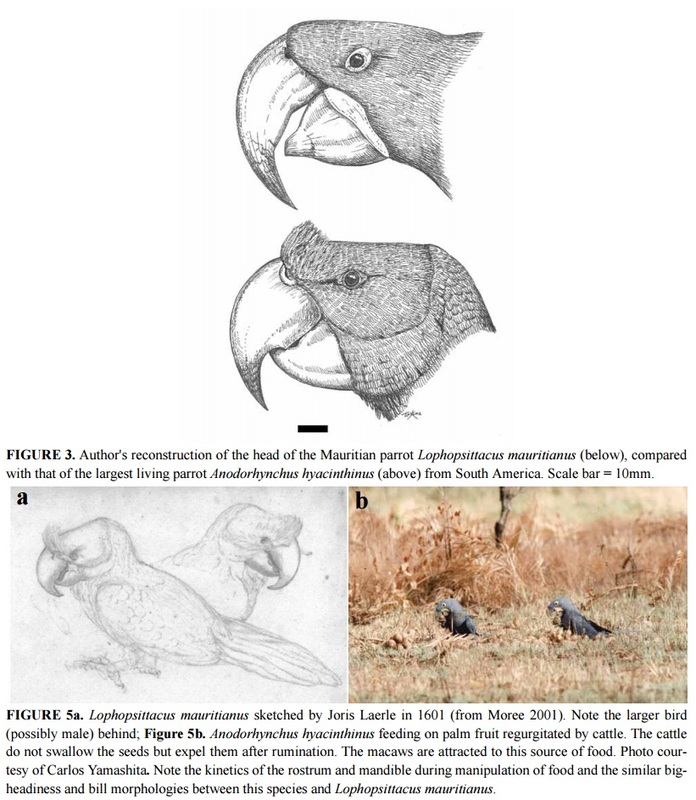 The Mascarenes are remote volcanic islands and biogeographical evidence presented here suggests that parrots reached this isolated group by island-hopping from India, probably during low sea level stands. Key words: Mascarene parrots, extinction , affinities, morphology, ecology, biogeography, Psittaculini, Psittacula bensoni new comb. Julian Hume. 2007. Reappraisal of the Parrots (Aves: Psittacidae) from the Mascarene Islands, with Comments on Their Ecology, Morphology, and Affinities. Zootaxa. 1513; 1-76. 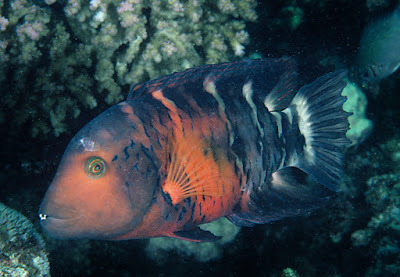 The labrid fish Cheilinus quinquecinctus Rüppell, originally described from the Red Sea, has long been regarded as a junior synonym of C. fasciatus (Bloch). 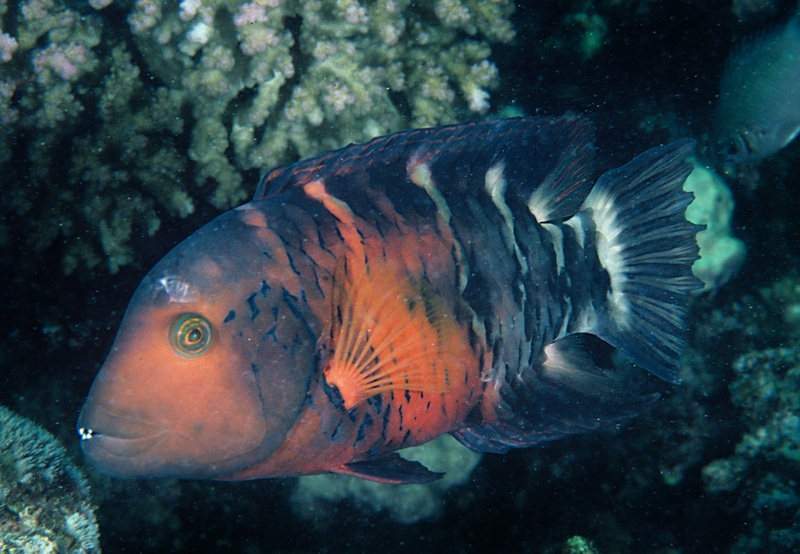 Herein, both nominal species are redescribed, based on examination of the types and additional material from the Red Sea (for C. quinquecinctus) and the Indo-West Pacific (for C. fasciatus). 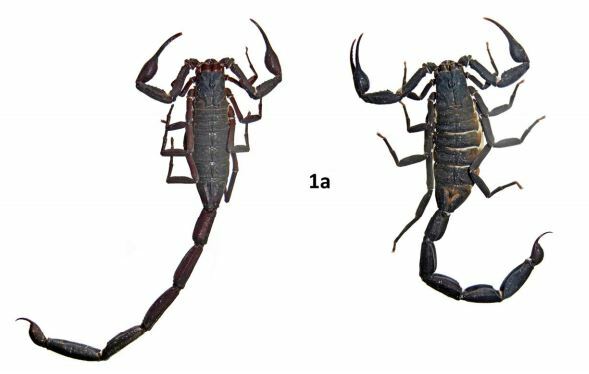 Rüppell's description of Cheilinus quinquecinctus was originally based on three syntypes, and the most representative adult specimen is designated as the lectotype. We show that Cheilinus quinquecinctus is restricted to the Red Sea and the Gulf of Aden, and it differs from the similar C. fasciatus in having modally fewer gill rakers on the first gill arch, a total of 13–16 (mean 13.9, usually 13 or 14 ) (vs. 13–16, mean 14.7, usually 14 or 15), in developing a ragged posterior margin of the caudal fin with age (versus only upper and lower caudal-fin lobes developing with age), and in its color pattern. 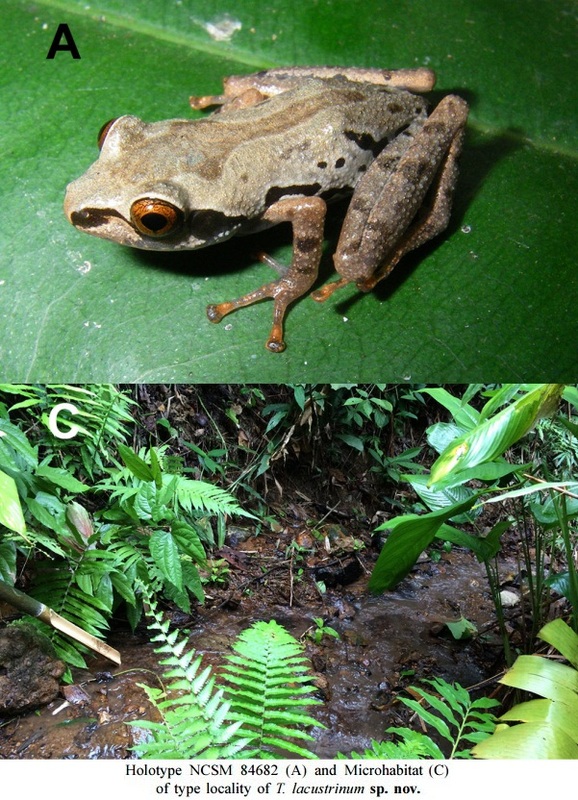 The phylogenetic analysis of the COI barcoding region accords with the species status of C. quinquecinctus with the placement of the two sister species in two divergent and reciprocally monophyletic evolutionary lineages. A full description of C. quinquecinctus and diagnosis of C. fasciatus is provided here for comparison. In addition, the data include a table of the results of the meristic and morphological examination of type and additional specimens of both species from throughout their distribution ranges as well as a table of gill-raker counts of all examined specimens. 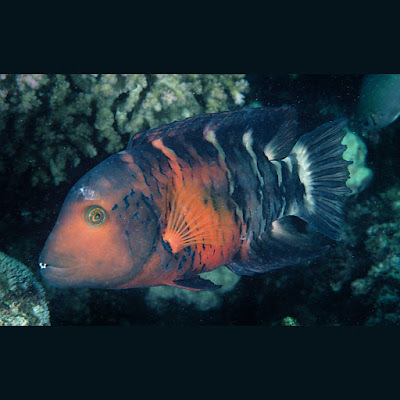 Underwater color photographs are provided for comparison of juveniles, females and males of both species. 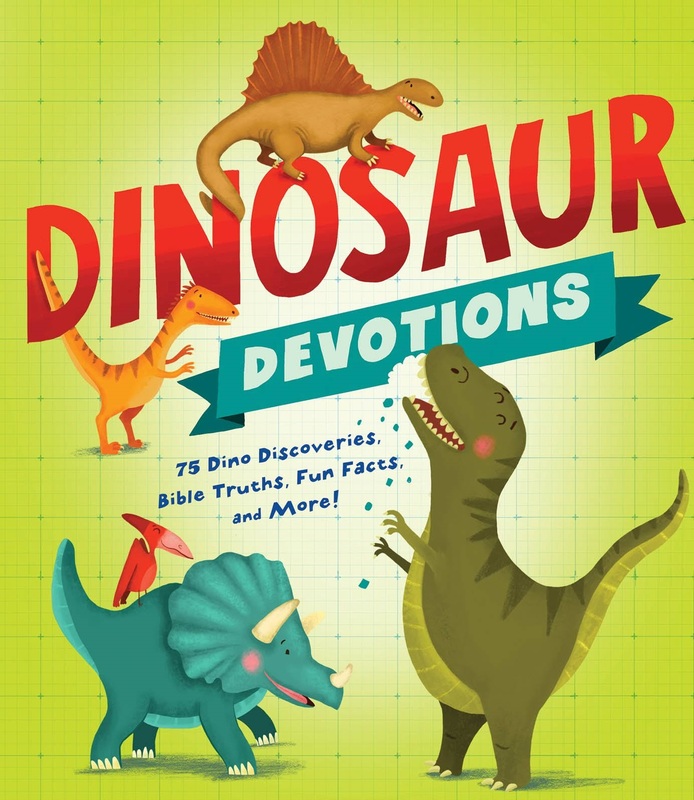 All ornithischian dinosaurs are herbivorous or omnivorous. 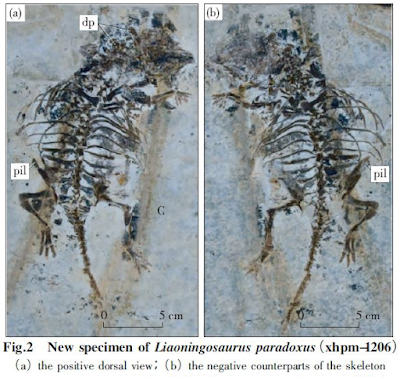 Ornithischian Liaoningosaurus paradoxus Xu et al., 2001 is an ankylosaur. 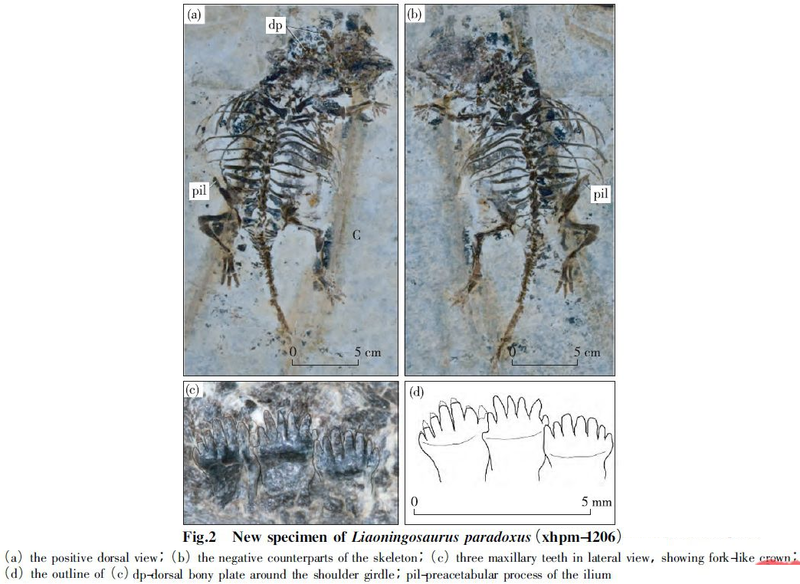 Here we report a new specimen of L. paradoxus from China. It contains a number of fish skeletons. We interpret those remains as stomach or gut contents and hence as strong evidence for the meat-eating diet of the dinosaur. With elongate and fork-like denticles of cheek tooth crowns, L. paradoxus has a dentition capable of penetrating into animals like small fishes. The carnivorous adaptation of the dinosaur is also supported by the ungual modification to a sharp claw in both the fore-and hind-limbs. The evolution of a shield-like ventral armor plate and the loose sacrum-pelvic connection suggest that L. paradoxus may have adopted an aquatic way of life,using the ventral armor plate to protect the body from underwater attacks; as such,the open suture between the neural arch and centrum of the vertebrae cannot be used to indicate the juvenile nature of the type specimen. L. paradoxus is the first carnivorous ornithischian dinosaur since dinosaur was first known in the 18th century and represents not only the first aquatic or semi aquatic example of armored dinosaurs but also the smallest species of ornithischian dinosaur so far known. Ji Q., Wu X., Cheng Y., Ten F., Wang X. and Ji Y. 2016. Fish Hunting Ankylosaurs (Dinosauria, Ornithischia) from the Cretaceous of China. Journal of Geology (Chinese). 40: 183-190; DOI: 10.3969/j.issn.1674-3636.2016.02.183. 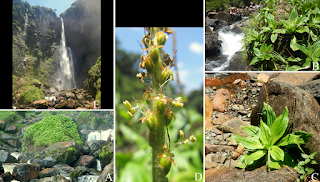 This article presents and describes Plantago humboldtiana, an extremely narrow endemic rheophytic new species from a waterfall in Corupá, Santa Catarina state, southern Brazil. The new species is unique in presenting a combination of type-G antrorse trichomes on scapes, pendulous inflorescences and 1-seeded pyxidia. Only one population is known to exist, despite intensive search efforts in nearby, similar environments. Its conservation status is assessed as critically endangered (CR) as the only known population is restricted to a dramatically small area, and is subject to extreme fluctuation due to occasional floods, and also to intense visitation by tourists, which can disturb its fragile habitat. We also present an updated identification key to the species of Plantago that occur in Santa Catarina. 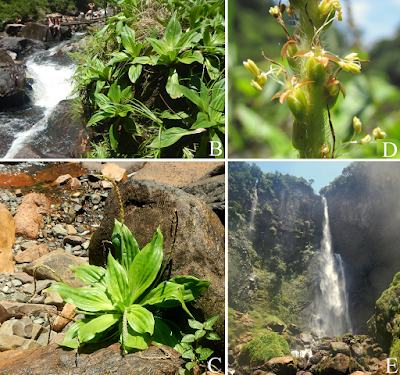 The recent description of three narrow endemic, threatened new species of Plantago in Santa Catarina, which is the Brazilian state with its flora best studied, highlights the need for more taxonomic research, especially in the neotropics. Figure 4: Photographs of Plantago humboldtiana. (A) The only known population of Plantago humboldtiana. (B) Detail of the environment. (C) Isolated individual clearly displaying the pendulous inflorescences, one of the key characters of this species. (D) Detail of inflorescence (photograph by Luís Adriano Funez). 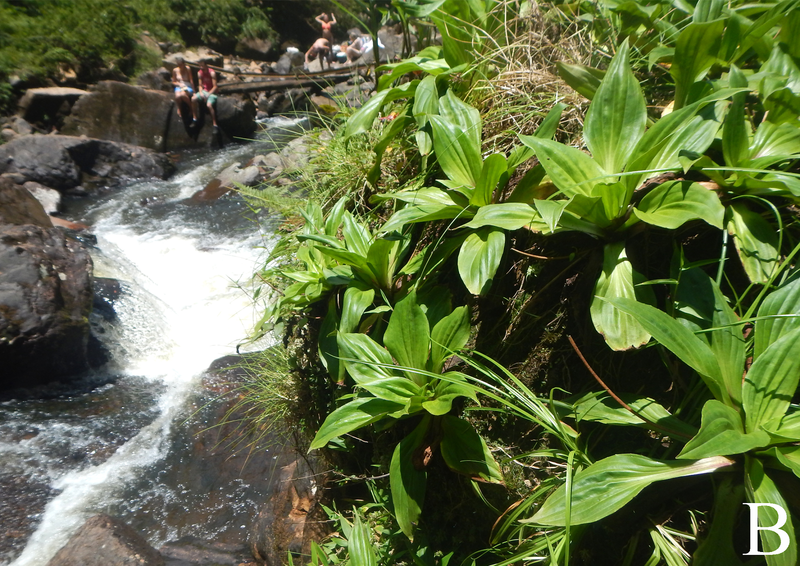 (E) Overview of Salto Grande waterfall, in Corupá municipality, Santa Catarina state. Gustavo Hassemer and Nina Rønsted. 2016. 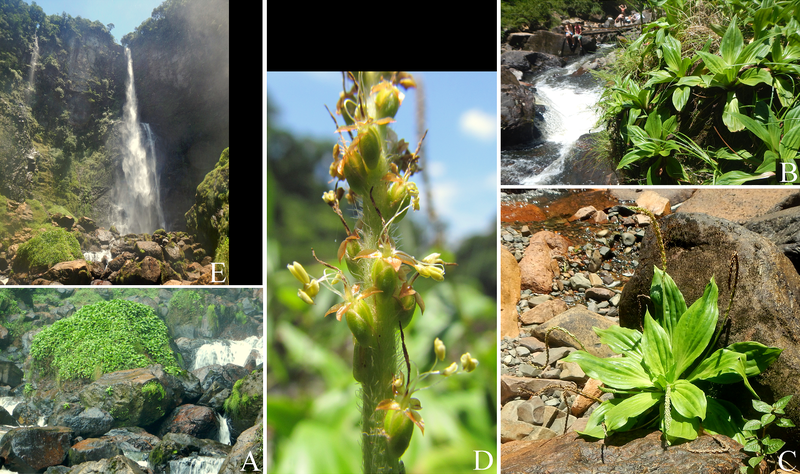 Yet Another New Species from One of the Best-studied Neotropical Areas: Plantago humboldtiana (Plantaginaceae), An Extremely Narrow Endemic New Species from A Waterfall in southern Brazil.